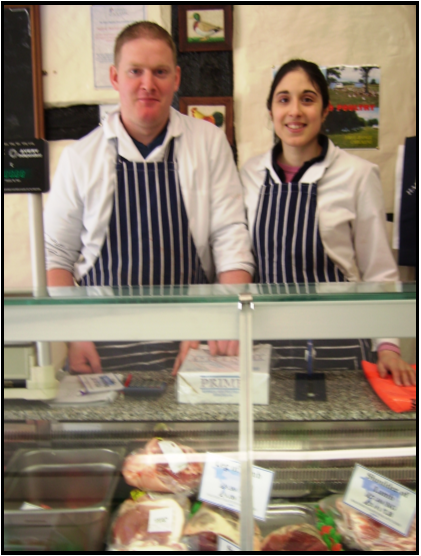 Lee, Nicki & The Team would like to welcome you to their shop which was opened in September 2007 by the Mayor. We offer a wide range of products including some of the more traditional items such as faggots, chitterlings, tripe and more… We hang all our meat and so can offer all cuts of beef, pork and lamb. Our meat products are British and local where possible. We also stock farm fresh and free range poultry. We stock the ever popular Gloucester Old Spot Pork and a variety of game through the various seasons. A frozen fish selection is always available. We home cook our popular ham, beef and pork as part of our traditional butchers deli counter. We also offer English and Scottish black puddings and a white pudding, chitterlings, tripe, pies, drippings and more. Our homemade produce includes our famous faggots, home cured bacon, sausages, burgers, pork free and gluten free items also available. The Tewkesbury Banger is the most popular sausage. Inspired by our customers the main ingredients are Beef, Pork, Horseradish and Mustard.